Starting a new business? Don't forget these common monthly or occasional business expenses in your budget and tax planning. The two most important financial tasks of a business owner are budgeting and tax planning. Budgeting, especially watching cash flow, keeps your business from overspending and getting into trouble with making payments. Tax planning has two purposes: To keep you from having unexpected payments at tax time and to keep your taxes to a minimum - legally, of course, through tax avoidance strategies. Although different types of businesses have different expenses, here is a list of the most common businesses expenses which most businesses must pay. Read through the list to be sure you don't miss any of these expenses. The key point in this article: The more business expenses you can take, the lower your business income, and the lower your business taxes. But you must be able to prove these expenses. To deduct these expenses on your business tax return, you must be able to prove that they are legitimate business expenses. You can't deduct personal expenses for business tax purposes. Be sure to keep excellent records. I'll point out places where you will need additional documentation. Every business needs a place to operate, and there is almost always a cost for the location. It might be a mortgage on a building or rent on a leased office or retail space, or a part of the cost of space in your home business. Building lease: If you are leasing a building or commercial space for your business, you can deduct all the costs associated with the lease. Home business location: If you have a business in your home, you can deduct some of the costs of the home, based on the space that is used both regularly and exclusively for business purposes. If you have a small office space in your home, you may be able to use a simple calculation to get the cost of this space to put it on your business tax return. Utilities, Phone, and Computer Expenses: If you rent or own a business building, your business must pay the cost of utilities: electric, gas, water, sewer, and other city services like trash pickup. If you are renting a location, some of these costs might be included in your rent. Don't forget the costs of cell phones and computer Internet lines. For a home business, these costs are pro-rated, depending on the percentage of the home is being used for the business. They are part of the calculation for your home business space deduction. You can deduct the cost of buying things like office furniture, retail shelving, machinery, and basically anything you have inside your business that lasts longer than a year. These are called fixed assets. The cost of assets is spread out over a number of years; this is called depreciation. It's a complicated subject and one that a tax professional should help you tackle. For now, just know that you need to keep good records on the costs of buying these assets, including setup and training in how to use them. Some equipment that you purchase for your business is considered listed property, a special IRS category that requires you to keep business and personal costs separate. If you buy a car or truck for your business, the cost is depreciated, like the other assets described above. To be available for the depreciation deduction, the vehicle must be driven at least 50 percent of the time for business purposes. Keep extra-good records on this one; it's one of the top three big issues in an IRS business audit. You can also deduct the cost of driving your car for business, using either of two methods: a standard deduction or actual expenses. Other services which most businesses incur are maintenance costs on the facility, equipment, and general building maintenance. Businesses also have costs for lawn mowing, snow removal, and other outside costs. You will need to keep track of the amounts you pay for outside services like janitorial services, professional services, or internet support. If you pay someone $600 or more during a year, you must provide that person with a 1099-MISC form and file that form with the IRS. Every business needs several types of insurance. For example, you will need property/casualty/liability insurance to cover catastrophic events (like fire and vandalism) and general negligence. You should also have business interruption insurance, which pays if you can't use your business location for a period of time. In addition, you may need specialized insurance, like malpractice or product liability insurance. Disability insurance on you and other key employees is also a good idea for most businesses. You will need to pay employees according to the payroll system you have set up, including employee benefits and payroll taxes. You may want to look for a payroll company to help you with all the complexities of this system. Employee benefits are a legitimate business expense. Here's a list of employee benefits that are deductible by your business. Every month you will probably need to replenish supplies, including office supplies and materials and special supplies needed for your type of business. You may need to keep an inventory of supplies if you have a lot of them. Set up a category for professional fees, including those paid to your attorney, CPA/tax advisor and other professional consultants. You may not pay these people every month, but budget money in this category just in case. In many cases, you will also need to give these professionals a 1099-misc form, as described above. Monthly payments on loans, lines of credit, and leases should be included in your business expenses. Keep track of the interest on these loans for tax purposes. Include monthly costs for advertising including social media marketing and other marketing and promotion activities, such as newspaper ads, billboards, and online advertising. You could include web maintenance costs here or put these costs under office expenses. Fees for your membership in a professional association or business group should be included here, as well as professional publications. You can't deduct costs for social clubs (like country clubs), but only those that are directly necessary for your business. Keep good records to show the business purpose for each for tax time. Travel expenses: Keep track of air travel, hotels, and meals while you travel. Business Meal expenses: You will only be able to deduct 50% of these costs, but keep detailed records and include them in your budget and taxes anyway. Business entertainment expenses are no longer deductible (2018 and forward). You will need to set aside money to pay income taxes by sending in quarterly estimated tax payments. These payments must include your estimated self-employment taxes (Social Security and Medicare for self-employed individuals), Employment taxes (taxes for employees) are deductible. Federal income taxes are not deductible, but other taxes are deductible business expenses. Don't forget to include an amount for miscellaneous expenses in your budget and your tax planning. You never know what might come up, and you will need money to pay for unexpected expenses. 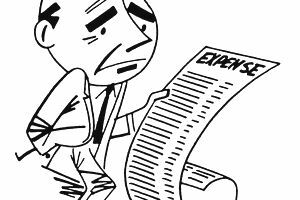 Finally, this article discusses some business expenses you cannot deduct. They may still be part of your budgeting process.